Salem is a walking town, with Essex Street acting as the main pedestrian artery. 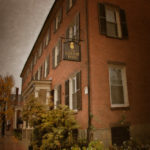 If you’re spending the night in Salem, haunted hotels are the way to go. This walking tour assumes you’re staying at either the Hawthorne Hotel, or the Salem Inn, which lie at opposites ends of this walk. Both are historic, with the Hawthorne Hotel being pretty much what you’d expect from a high end, historic hotel, including a perfectly acceptable lounge and very good restaurant. The Salem Inn is a bevy of historic homes and wins on charm, as how often do you get to spend the night in a 19th century mansion? If you want to take advantages of the attractions, you’ll want to at least start in the daytime, and it’s a good idea to check online for show times and if tickets are required. If you want creepy ambiance, you’ll want to take the walk at night. Or to get the complete feel, do it twice! Giles Corey was pressed to death by heavy stones in the field which is now the Howard Street Burial Ground, adjacent to the old Salem Jail. Start at the Hawthorne Hotel and slip to your right, with a view of the bandstand sitting on the Salem Commons. Cross Washington Square at Brown Street when you see the Salem Witch Museum, a former church, which is just to the right of the statue of the Puritan and first settler of Salem, Roger Conant. Continue down Brown till you reach Howard Street. On your left is the John Ward house, one of several first period Salem homes. Make a right on Howard and you’ll soon see the Howard Street Burial Ground on your left. It was here that Giles Corey was taken from the dungeon and pressed to death under heavy stones for failing to confess to witchcraft. If it’s daytime, wander amongst the stones for a bit, and exit the front entrance facing bridge street. If it’s night, skirt the burial ground, make a left at the end of the street and a right at St. Peter Street. The John Ward House is one of the few remaining structures dating from the time of the Salem Witch Trials, and is now part of the Peabody Essex Museum complex. Facing down St. Peter, to your left is the old Salem jail, reputed to be haunted and now available as condominiums. 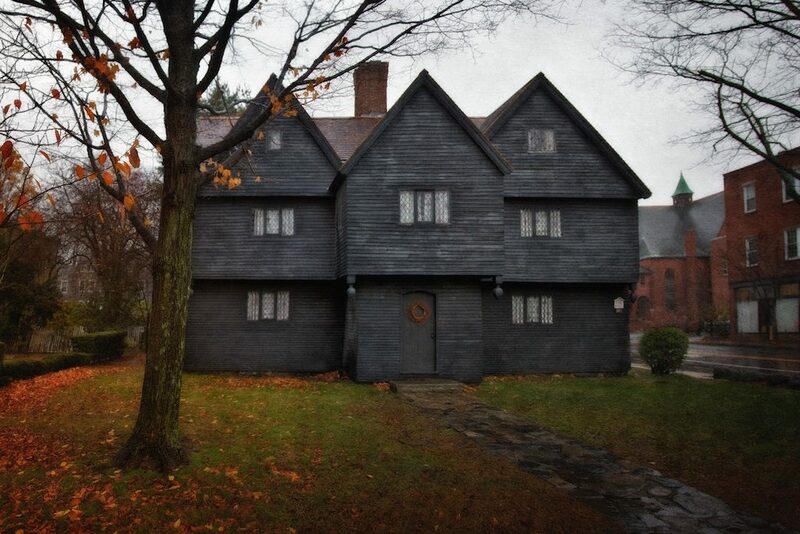 Now it’s not the jail which dated from the Salem witch hunts. That stood on your right, where the GTE building now stands. So continue down St. Peter Street back to Brown, which will turn into Church Street. If you were a convicted witch on your way to Gallows Hill, you would have continued on down to Essex and have made a right. But we’ll come back up Essex on the way back. If you’re in Salem on a day trip, then you’d likely be parking in this block. Cross over Washington onto Lynde Street and go right, where you’ll pass the nineteenth century courthouse, the Witch Dungeon Museum, and the on down to North Street. Make a quick right, then cross the street onto Federal. This is a lovely block of nineteenth century homes, part of the Samuel McIntire Historic District, named for one of America’s first notable architects, comprised largely of Federal style homes built from the wealth gained when Salem had a lucrative trade with China. The Ropes Mansion, c. 1728, Built for merchant Samuel Barnard is but one example of the excellent architecture to be found in the McIntyre Historic district. The home is also reputed to be haunted. Make a left on Beckford, down to Essex, where you’ll make another left. On your right you’ll see the historic Salem Athenaeum, where Nathaniel Hawthorne once reported seeing a ghost reading a book, to your left a bit further down is the Ropes Mansion, another likely haunted spot. To your right you’ll see the haunted Salem Inn, where you can start this tour in reverse, as well as get a great room at a great price, complete with a working fireplace in the cooler months. 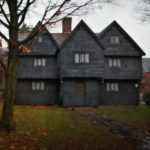 On the corner of Essex and Summer you’ll see the Salem Witch House, the only structure still standing with direct ties to the Salem Witch hunt. Cross Sumner and continue up Essex. When you reach Washington, Essex becomes a pedestrian walkway, where during the month of October you’ll find the bustling heart of Salem. On the right you’ll see the statue of Samantha Stevens of Bewitched, and across the street is Rockefella’s, which is usually hopping during the evening. About halfway up the block you’ll see Derby Square on your right, with Old Salem Town Hall. 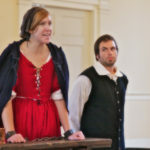 During the tourist months, Gordon College presents Cry Innocent here, a dramatization of the trial of Bridget Bishop, well worth a viewing. It actually starts on Essex Street with her arrest, so if you see a commotion, follow the crowd. Or check their schedule for show times. Here you can tour the Old Town Hall and exit out the other side, or skirt the building and continue through Derby Square to Front Street, where you take a left. Hungry? Make a left when you get to Central Street and try Red’s, an old fashion diner with a truly expansive, and not expensive menu. For a truly jaw dropping experience, order the large stack of pancakes. 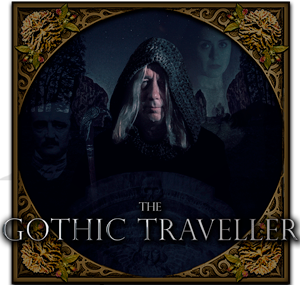 Otherwise, continue down Front Street, which becomes Charter Street, till you come upon the Burying Point Cemetery, dating back to 1637 and chocked full of beautiful carvings and interesting inscriptions. If you take a right on Liberty street, then another quick right just past the Samuel Pickman House, which was only about a decade old in the Salem Witch hunt of 1692, you’ll find the Salem Witch Trials Memorial, adjacent to the back of the cemetery. Actually it’s one of many, as nearly every town with any connection to the trials has a memorial. But this is a particularly good one, with inscriptions for all the official victims. Contrary to popular belief, none of them are buried here. Instead all but a couple who were spirited away, were buried in a shallow, mass grave near where they were hung at the base of Gallow’s Hill. Feel free for your daily dose of kitsch on down at the end of Liberty for the Salem Wax Museum, or go back to Charter Street. Crow Haven Corner was the original witch shop in Salem, originally owned by Salem’s unofficial official witch, Laurie Cabot. 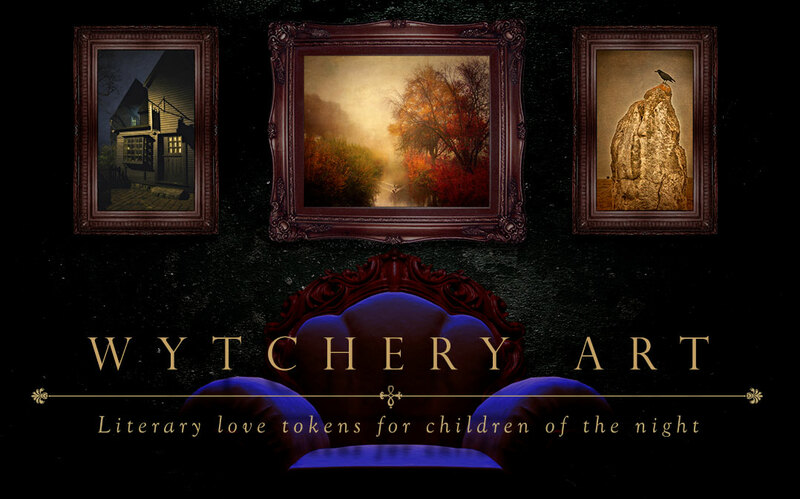 The shop caters to witches, Wiccans, pagans and the curious. Across the street is the Peabody Essex Museum, where you can easily spend a day or more learning about Asian art and culture, and in particular, the maritime trade which brought Asian products to the West. You can slide along the side of the building to Essex Street, and make a right for shopping and more attractions. Just before you get to Hawthorne Boulevard and the Hawthorne Hotel, you’ll find Crow Haven Corner, the original Salem witch shop. 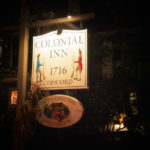 You’ll also run across the Old Spot Tavern, good for a drink or excellent pub food. Make a right on Hawthorne, wave at the statue of Nathaniel Hawthorne, and continue on down to Derby and make a left. Start up the street and you’ll find all the shopping you might want at the waterfront. If you wind around enough you’ll come across the Capt’s Waterfront-Premium Steak and Seafood Grill. A bit more upscale than Reds and the Old Spot, but a lovely place to sit on the water for fine dining. On your right is the Salem Maritime National Historic Site, and The Friendship, a replica of an American merchant ship that was launched in 1797, Tours are available, weather permitting, and there’s also a short film for free at the Salem Maritime Orientation Center. You are of course at the location of the old docks, once one of the most active and richest seaports in the world. 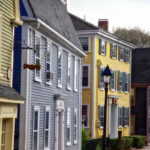 It’s hard to escape the maritime feel in this neighborhood, which alternates between shops, restaurants and residences. Make a right on Turner and at the end of the street you’ll come upon the Turner Ingersoll Mansion, better known as the House of the Seven Gables. 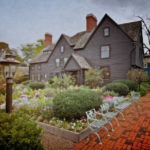 If you’re really into your Hawthorne history, make the right before you get to Turner on Hardy, which takes you to the birthplace of Nathaniel Hawthorne, available for tours as part of the House of Seven Gables complex. Finally, make your way back down Derby to the sidewalk to your right just Palfrey Court, between the Derby House and the Hawkes House. Or continue to the corner for another look at the Old Customs House and make a right on Hodges. Keep going north whichever route you take, cross Essex and keep going till you find yourself once more on Salem Common, where we started.